Homes for sale in Dover range from condos and townhomes in the low $200,000’s to homes from the mid $250's. Select your price range or specific Dover real estate listings below. Click here to view listings in Dover Glen, West Dover. 41 Properties Found. Page 1 of 1. Bordered by the famous Inglewood Golf Course to the west, Dover is a pleasant residential neighborhood located in the south-east quadrant of Calgary. 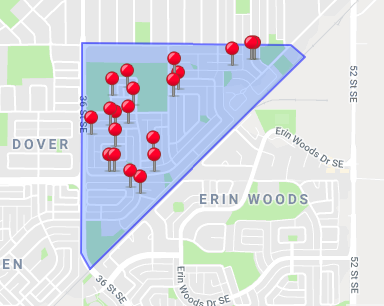 The community is surrounded by the 36 Street on the east, the Deerfoot Trail on the west, the Peigan Trail on the South and 26 Avenue S on the north. Established back in 1971, the community in Dover enjoys a central location within the city with Downtown Calgary barely a 15-minute drive away. Homes for sale in Dover include a myriad of options ranging from condo apartments to townhomes and even single-family detached and attached units that are readily available for sale at an average price of $350,000. Despite the fact that it is one of the oldest communities in this part of the city, Dover Real Estate has managed to retain its old-world charm and traditional traits, glimpses of which can be easily seen in its original landscape and architecture. 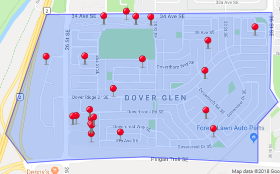 Schools for specific Dover homes, please refer to the designated schools search tool on the Calgary Board of Education and Calgary Catholic Designated School websites. For a Report Card on School Rankings of Calgary Schools get in touch with one of our Dover Real Estate agents. A K-6 school, Saint Damian encourages its student body to abide by the rules of the Code of Conduct that traces its roots to the six core values upheld by the Catholic Community of Caring. A part of the Calgary Catholic School District, the Holy Cross School serves around 430 students from Kindergarten to the Ninth Grade. Located in the community of Greater Forest Lawn, this school believes in the holistic development of its students based on academics and faith.